In Cement House Cemetery, West-Vlaanderen, Belgium. Grave location : XIV. F. 16. 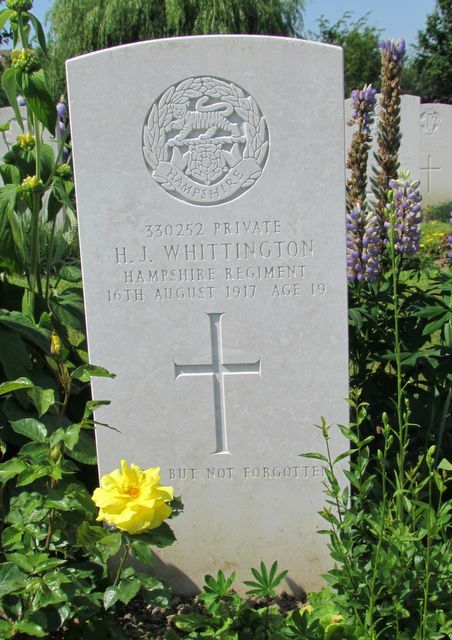 Son of Charles Henry Whittington and Mary Whittington (née Blunden), of 43, Green St., Ryde. Born : 1898, Arreton, Isle of Wight. 1901 : Charles and Mary Whittington, with their children including Harold aged 3, are at 72, Upton Road, Ashey. Charles Whittington is a Brickmaker. 1911 : Charles and Mary Whittington, with their children including Harold aged 13, are at the Brickyard, Ashey, where Charles Whittington is a Brickmaker. See Report on memorial service to East Wight Scouts.